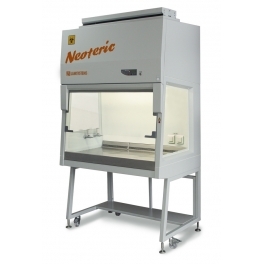 The Biological Safety Cabinet provides product, operator and environment protection. 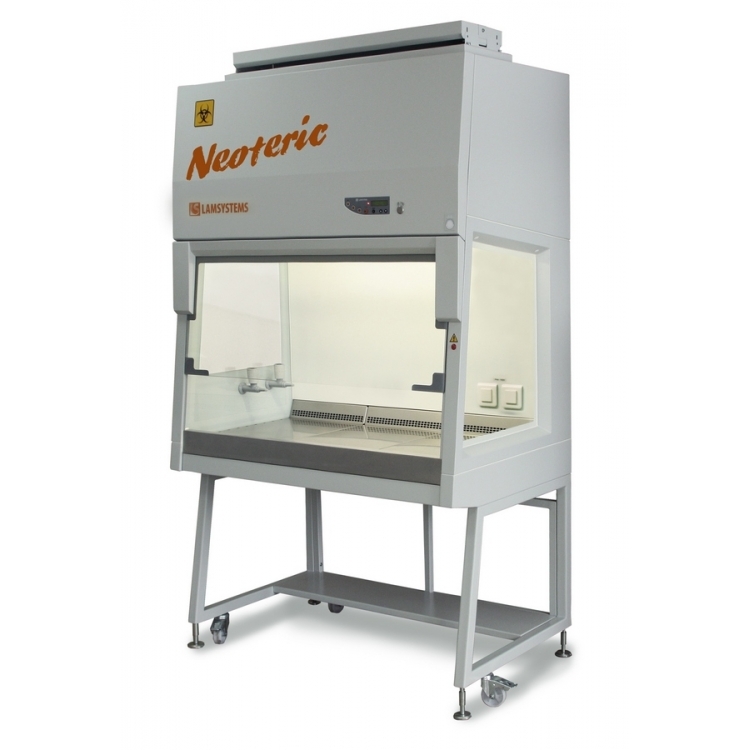 It is designed for work with agents of biosafety levels 1, 2 and 3.NEOTERIC model features a good ergonomics, low noise level, low energy consumption, easy cleaning, maintenance and repairs. The number of requests for biosafety cabinets featured with external UV lamp continuously grows since UV lamps located inside the work chamber create barriers to the downward air flow and form air swirls (turbulence) which lead to cross-contamination of the product. Specialists of LAMSYSTEMS follow the trend and design their cabinets with pullout UV units placed at the bottom of the cabinet (outside contamination zone) and used only when it is necessary to make disinfection of the work chamber. As a result, the UV lamp is protected from accidental damage during loading of the equipment into the cabinet as well as during disinfection process. In its working position, the UV unit completely covers the front opening of the cabinet preventing emission of pathogenic agents into the environment and ensuring the protection of the personnel. The lamp is controlled by an optical position sensor insuring protection of personnel from accidental irradiation. A unique DRIVE-N-ROLL technology provides easy sanitation and use of the UV unit. Moreover, it guarantees the reliability of the pullout mechanism for the entire service life. Finally, there is no need for special place for storage (as in case of removable design). 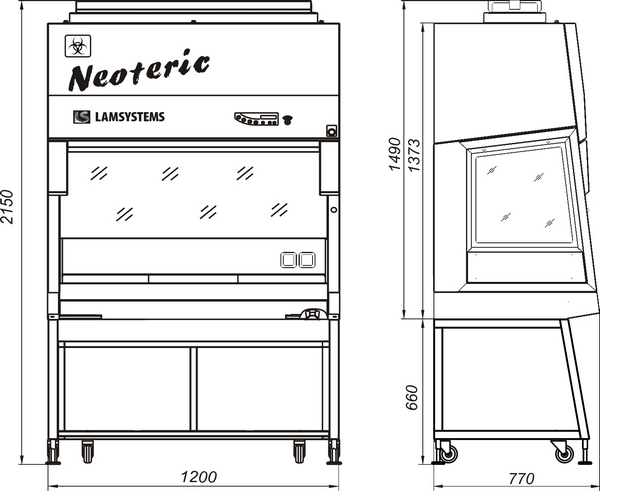 The Microbiological Safety Cabinet NEOTERIC cabinet is provided with the audio-visible indication system REFLEXLS, and in case of blocking the front grille on the table surface, it will immediately warn the operator about worsening the cabinet protective properties. This technology is patented and only used in LAMSYSTEMS cabinets. Using the audio-visible alarm, the system of monitoring the cabinet operating modes warns the operator about the air flow imbalance in the working chamber. The optical sensors of the front sash and the UV unit position provide total control of the cabinet operating modes. Easy replacing of the filtering elements. The table top is made of segments for a more convenient working zone disinfection and autoclaving. Produced in conformity with the requirements of European standard EN 12469:2000. *The power consumption with newly installed uncontaminated HEPA filters. 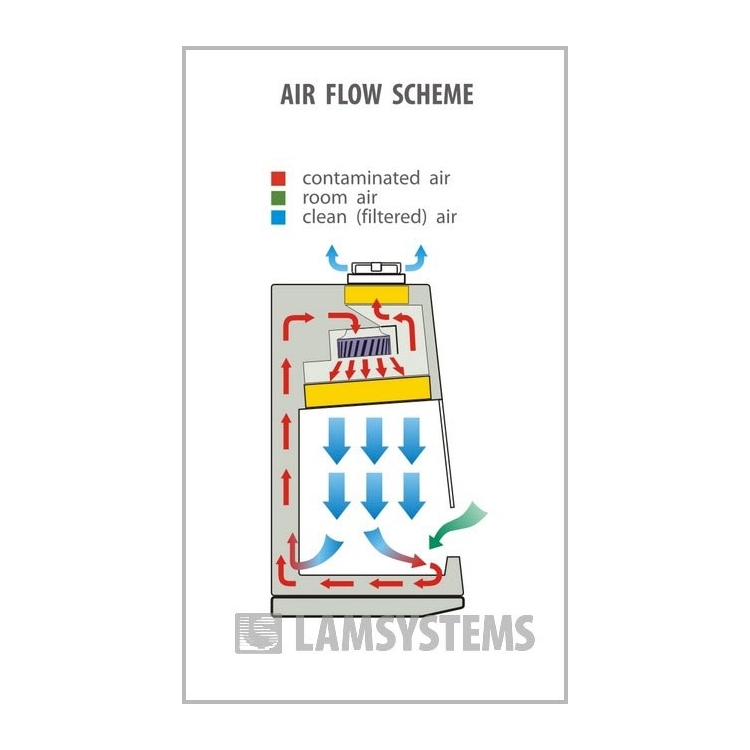 The air flow in the working chamber – vertical downward unidirectional (laminar). The air flow in the front opening – directed into the front table grille, creating an air curtain. There is no risk of plenum contamination (the internal high pressure plenum is completely surrounded by low pressure zones).